Do you like Home Sheep Home? Share it with your friends. You will love the three heroes in the game "Home Sheep Home". They are three sheep - Shirley, Shaune and Timmy. You have to pass 15 levels with them in a hard terrain, which is also dangerous. 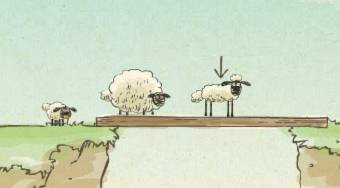 The sheep have unique abilities. Shaune jumps high, Shirley is very strong and Timmy limber. Watch out for the time limit, within which you have to get the sheep to the finish. Do not loose time by waiting.